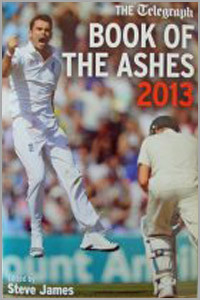 The first of, I imagine, a few books on the latest Ashes series which saw England win their third series in a row against Australia, has been published by Aurum Press using articles by the Daily and Sunday Telegraph as they appeared after each day’s play. Personally, I am happy to see this book. The Daily and Sunday Telegraph papers have always had excellent correspondents and writers and I always enjoyed their coverage. Note the word enjoyed as I regret to write that we discontinued it at home not least because the sports section was the only part I read... At least now, I have their coverage in its entirety in one book. Many of today’s excellent writers including Derek Pringle, Scyld Berry and Steve James – who edited the book – have had their articles re-printed in this book along with expert analysis from, amongst others, Geoffrey Boycott, Simon Hughes and Shane Warne so that readers can bring back memories of England’s 3-0 victory. Although possibly the series was not one of the most memorable of recent years, there were many outstanding performances and some of the Tests were a lot closer than the 3-0 result suggests. After the supremely exciting first Test where England prevailed by just fourteen runs after debutant and last man, Ashton Agar, narrowly missed becoming the first No 11 to score a Test century, to The Oval where England might have won due to an apparently generous Michael Clarke declaration until halted by bad light, there were many memorable moments. Were England so far ahead that a 3-0 result adequately reflected the difference between the sides? With all the expert articles within the book, readers will have the benefit of all the excellent writing within the covers. A scorecard at the end of each Test may have added to the overall effect of the book but this is a decent book which will remind readers of the events of the 2013 summer as England attempt to gain their fourth successive Ashes victory in Australia very shortly.